Things just got real folks! At their big event today, HP finally announced its swanky new tablet to the world, and it’s a beauty! Called the HP TouchPad, the tablet is the result of Palm being absorbed into the world of HP with webOS beating at the heart of the device. With more sliding and swiping than you can throw a stick at, this new version of Palm’s webOS brings the software up to version 3.0 and it’s never looked so good. The first thing that jumps at me screaming ‘PlayBook beater’ is the 1.2GHz dual-core CPU HP has packed into the TouchPad. With BlackBerry’s PlayBook being powered by a similar chip running at 1GHz, we expected the Canadian tablet to be the king of speed, at least until the iPad 2 gets announced. But now it’s clear, HP is the one pushing the envelope when it comes to cramming the fastest CPUs into a tablet device. For now at least! Another interesting spec is the screen size and resolution. That’s the same screen that’s currently used in Apple’s iPad, which probably explains why the TouchPad bears more than a slight resemblance to the wonder-tab. Whether the second-generation iPad will use the same screen or go pixel-mad remains to be seen with rumors and opinions falling on both sides. 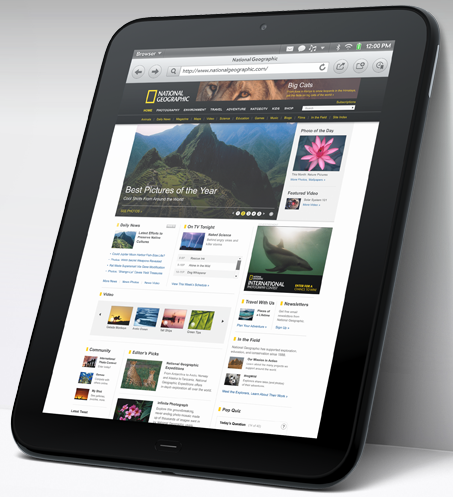 Obviously people will draw comparisons with the iPad when looking at a TouchPad, and with good reason. Both are the same size, same color, same form factor and both are gorgeous. The similarities even stretch to some of the apps HP have put together, with their email app in particular looking all too familiar. Whether that’s a bad thing or not, I’m honestly not sure. The email app on the iPad works a treat, so why re-invent the wheel? Granted, the TouchPad version does sport some interesting additions such as draggable pains ala Twitter for iPad too. The real action comes from the impressive webOS. Many have said for a while now that Palm’s operating system was let down by poor hardware in the shape of the original Pre, and few could argue. Anyone who’s spent any time with a Pre will admit the OS showed promise but was hamstrung by a slow CPU, not enough RAM and a poor screen. Now however, things are different. Watching the videos posted by Engadget, it’s clear that the beefy CPU gives webOS the power it needed since day one. Panes slide smoothly, zooms are effortless and the ‘real’ multitasking (at least appears) to work beautifully. Whether this fluidity continues after hours of heavy use though, we just don’t know as yet. Notifications are one area Apple’s iOS has fallen down, and with each major revision, the Apple faithful have hoped and prayed for a fix for the software’s achilles heel. This is an area the TouchPad looks to be getting things right. When a notification arrives, it’s placed under an icon in the upper-right of the screen. Tapping the icon brings down a list of notifications sorted by type. Speaking of notification type, have I mentioned the integration with Palm, I mean HP’s phones? No? 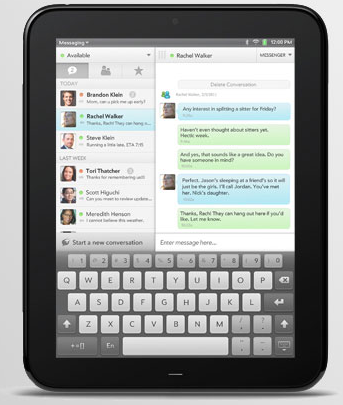 Well if you’re rocking a TouchPad and one of the new phones announced today then the two can talk to each other. That might not sound so hot, but how about leaving your phone on the counter and routing all your calls, emails, SMS and anything else your phone can do through your tablet? That NEEDS to be in the next iPhone/iPad and BlackBerry/PlayBook. I’ve just thrown together a few hundred words, rambling about the TouchPad and it occurs to me that I might have come across as a raving Palm (damn, I mean HP!) lunatic and/or fanboy that’s getting ready to dump my iPad into the nearest river. I’m not. Yet. Allow me to clarify. I like love tech. I love new tech, and I really love new tech that does something new. To me, the TouchPad is just that. Palm (oh I give up!) could have thrown out a standard tablet, used a middling CPU and shoehorned webOS 2.0 onto it. But they didn’t. They’ve gone out and found the fastest dual-core CPU currently announced for a tablet and paired it with what in videos at least, appears to be the most unique, eye-catching OS in a long while (I don’t really count the Pre!). And I like that. A lot. Now this doesn’t mean Apple won’t come out in a few weeks and blow the TouchPad out of the water. They might have a 1.4GHz CPU up their sleeve, coupled with a new form-factor and more gestures than we know what to do with. But what about the OS? I’m going to stake my not-so-stellar reputation on us being given a version of iOS not too dissimilar from the one we’re using today. And were using last year for that matter. We’ll get some new transitions and sliding windows, sure, but where’s the innovation? Apple wowed us all last year when they announced the iPad, but now it’s time to step up a gear and show the world what they can really do. Why is it time? The competition is starting to hot-up, Google, RIM, Microsoft and now HP are all in the game, and Apple need to show they’re up for the fight.